I was a member of the team that developed this Integrated Impact Assessment Model and Tool. This IIA model is based on three domains: environment, society and economy. These in turn have cross-cutting themes: sustainability, health and diversity. Impact assessment methodologies have been reviewed and incorporated into this integrated impact assessment model specifically the learning from the LHC’s, and other, health impact assessments. produce a report which is SEA compliant i.e. content and process of this model are SEA compliant. We suggest that the IIA team should have expertise which spans the domains and cross cutting themes. The process involves three stages of consultation: each round of consultation involves a wider group. The first is restricted to members of the appraisal team and the policy team. The second involves statutory and strategic partners and looks at the scope of the IIA. The third stage involves consulting on the draft IIA report so that the recommendations and the policy decisions can be subjected to public scrutiny. 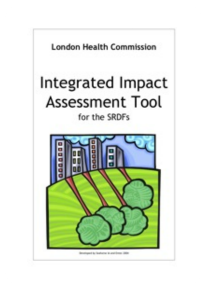 This model for Integrated Impact Assessment has been developed for the teams preparing the Sub Regional Development Frameworks (SRDFs) for London. Many models for impact assessment and appraisal show underlying similarities in approach and convergence on key issues. Although there are similarities between different forms of impact assessment (IA) there are also important differences: for example practical issues eg the amount of guidance which the different models provide to the practitioner/plan team and conceptual issues eg some IAs aspire to be value-free, neutral and objective while others explicitly draw on qualitative and less quantifiable data (this might include evidence from people likely to be affected by the initiative under assessment). This integrated impact assessment (IIA) model is based on three domains: environment, society and economy. The model does not prioritize one domain over another. People who contributed to the development of this model were clear that policies for sustainability are policies for a healthy public policy. 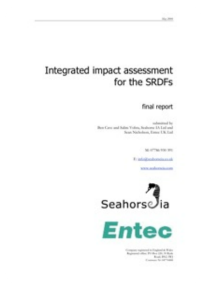 The work to develop this model contributed to thinking about how impact assessment should be used in the SRDFs and the implications of conducting integrated impact assessment within a complex organisation such as the GLA. READ THE MODEL AND TOOL AND THE ACCOMPANYING REPORT BELOW.